MIAMI (CNS) — Hurricane Irma’s destructive winds blew wreckage and disruption throughout Florida. But Miami’s Catholic Charities chief was particularly anxious to access the devastation in Monroe County and the Florida Keys. 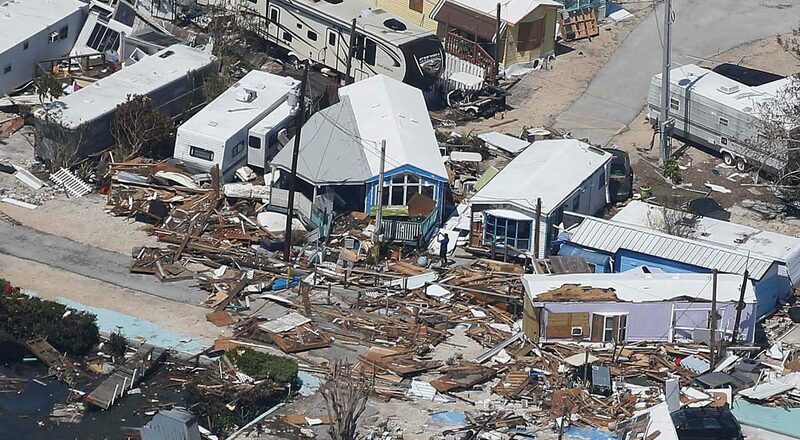 Speaking with the Florida Catholic newspaper Sept. 13, Deacon Richard Turcotte, the agency’s CEO, said the Overseas Highway through the Florida Keys was not yet fully open, making it impossible for to get a firsthand look at the devastation to Middle and Lower Keys. The area reportedly sustained severe damage from Irma. Those high priority places include Marathon Key, Cudjoe Key, Big Pine Key and Key West, among others. “It looks like (news reports show) there is absolutely nothing left in Marathon,” Deacon Turcotte said, noting that poor cellphone communication and transportation logistics were slowing the flow of information several days after the hurricane. In terms of Hurricane Irma’s impact on Miami-Dade and Broward counties, it appears that “there wasn’t the devastation that we saw in the Keys, so the greatest challenge will be getting services up and running there,” he said. State officials confirmed a 13th death attributable to Hurricane Irma in Florida, with many of those fatalities in Monroe County. Irma will be remembered as one of the Atlantic’s strongest hurricanes on record, with peak winds of 185 mph, and Category 4 strength when it landed in the Florida Keys. Some sources are predicting that insured losses from Hurricane Irma could total $18 billion in the U.S. In addition to Catholic parishes and schools throughout the Florida Keys, the region is home to a Catholic Charities-affiliated residential program, New Life Workforce Housing in Key West and other homelessness prevention programming for Monroe County. Workforce Housing had 32-bed capacity and Catholic Charities was in the process of trying to build 37 new units in Key West, but Hurricane Irma’s impact will likely set the plans behind schedule, Deacon Turcotte noted. He said his agency’s team has been working in three broad teams following the hurricane, with a goal of pulling together damage assessment to facilities, Charities programming status and prioritizing future response efforts, which are expected to be long term in focus. “I have been taking all that information and then determining where the greatest damage is, and we can say it is Marathon Key so far,” Deacon Turcotte said. “We are having daily conference calls with other state Charities agencies and Catholic Charities USA about available resources and stages of recovery,” he said, adding that the seven Catholic Charities agencies of Florida spoke by phone Sept. 13 with the president of Charities USA, Dominican Sister Donna Markham, who may later make a personal assessment tour of the area. Right now, the Keys infrastructure, he said, cannot tolerate lots of volunteers and people of goodwill coming down to an area with minimal services, and with power outages, shortages of gasoline, foodstuffs and crippled infrastructure. In general, before Hurricane Irma arrived, Catholic Charities programs across the archdiocese had evacuated residential clients in anticipation of the storm, including the relocation of some 52 unaccompanied minors living in Miami to a temporary situation in Houston. Other residential clients at St. Luke’s Center for alcohol abuse and substance addiction and New Life Family Center in Miami also were temporarily relocated and many of those residents are returning as power is restored in the region. Many Catholic Charities staff members have been working from home throughout the hurricane crisis until South Florida gets back to normal. “In the future we may need to do outreach for long-term recovery, but right now it is too early to evaluate how to respond in Miami and Fort Lauderdale areas,” Deacon Turcotte said, noting that the Federal Emergency Management Agency, or FEMA, will eventually publish data that will give some indications of who needs help and particularly was unable to get federal assistance. And with each hurricane come lessons for emergency services providers including Catholic Charities. The area’s nonprofit sector has organized itself into regions and geographic sectors to share emergency resources. Hurricane Irma proved unique, Deacon Turcotte noted, for having directly impacted almost every diocese in the state, including the Diocese of Pensacola-Tallahassee, which had the distinction of receiving many of the evacuees from other regions. Hurricane Irma also was responsible for causing significant harm to populations in the Caribbean, including the U.S. Virgin Islands. Editor’s Note: For more information or to make a to Hurricane Irma related donation, visit http://www.ccadm.org.